Concave curvature of sign holder catches customer atttention easily. Tall 59" height places posters at eye level for maximum visibility. 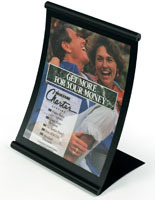 Magnetic framed Lexan® protective lens keeps graphics safe and secure. 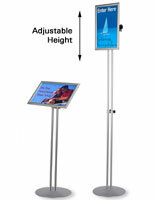 These poster stands are great as a trade show display or as a lobby fixture! The display sign has a unique curved style. 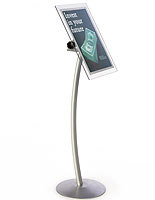 These poster stands are commonly seen in business lobbies and entrances. 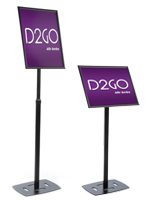 The tall, simple design makes these sign displays ideal for use in areas that have a constant flow of foot traffic. 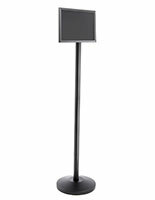 The black coloring of these poster stands is neutral and will complement other fixtures in any type of commercial environment. The framing on this unit is completely metal which allows for the magnetic lens to seal the graphics in place. Each of these poster stands features a curved sign frame to complement the curved pole. The concave construction also creates a tilted angle for a better view of the sign. 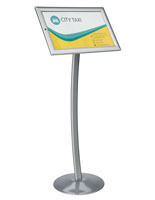 These poster stands, also called sign pedestals have a magnet frame with a flip up, non-glare lens cover. To change out graphics simply lift the durable Lexan® lens cover and insert an 11"w x 17"h self printed graphic. The lens on these poster stands insures that signage is sealed tightly by the magnetic frame. 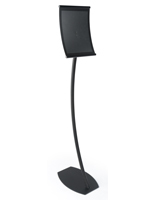 This unit stands 59" tall with a 9.5"wide by 14" deep base. Each of these poster stands ship unassembled which helps to keep freight costs at a minimum. A complete set of assembly instructions are included, and one person can quickly assemble this display. 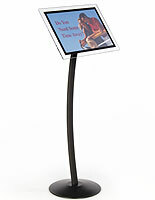 Buy these poster stands for use in your office, lobby or store. 12.0" x 59.0" x 20.0"